Befitting the big Bicenten­nial setting, a Connecticut Yankee fired another shot heard ’round the world. 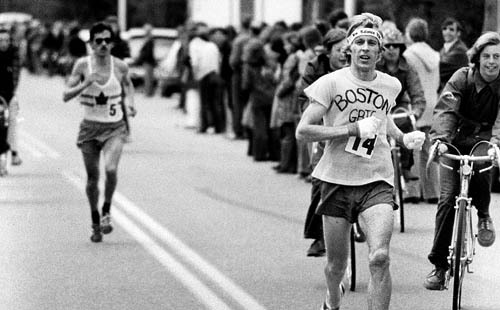 Will Rodgers’ capture of the Boston AA’s 79th marathon race in record time of 2:09:55 was a mind boggler, 35 seconds under Ron Hill’s super mark of 1970. The pale, peak-nosed Wesleyan alumnus, 27, from Jamaica Plain via Hartford — an authentic outsider in the advance speculations — rode the blustery n’west tailwind to the fifth fastest clocking ever recorded globally. He served notice on the Montreal Olympiad of next summer that the USA is still in the business of pro­ducing Frank Shorters… by fragmenting Shorter’s citizen’s record (not in the BAA) of 2:10.30. Rodgers, striving for his master’s degree in special education at Boston Col­lege grad school while living in Jamaica Plain, led a dazzling Yankee Doodle dandy performance in a race traditionally domi­nated by the patter of foreign feet. Two minutes behind him, Steve Hoag out of the Minneapolis area was runner-up, running five minutes below the fastest time of his life in 2:11:54. Finishing off the first 1-2-3 sweep of the race by Amer­icans in 32 years was Tom Fleming, runner-up the two previous years, but Tom raced dramatically faster this time — 2:17:05. Equally brilliant in the Hers division as was Will Rodgers in the His event was Fraulein Liane Winter of Germany. 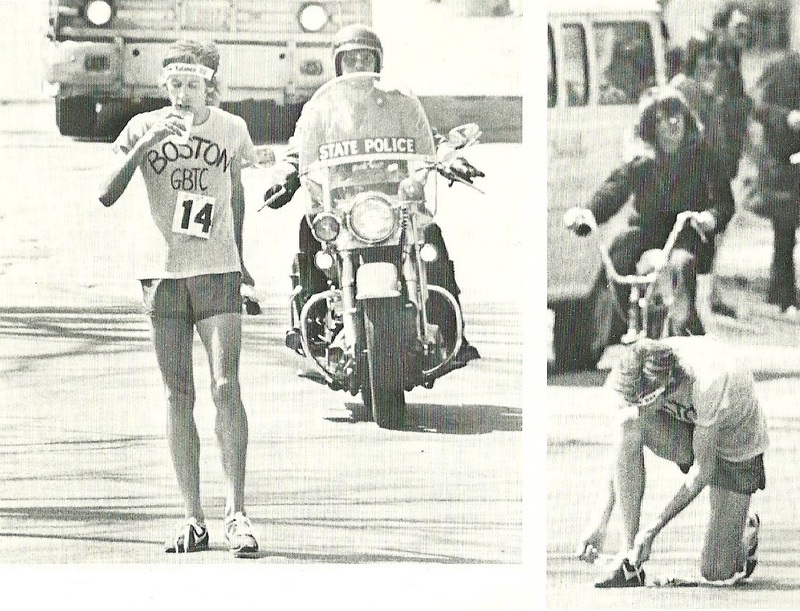 This effervescent runner, who called for beer on arrival at Big Pru, had this kind of a day out of the Hopkinton-Boston race course of 26 miles, 385 yards: Winged to the finish in the fastest marathon time ever credited to a woman any­where — 2:42:24; five min­utes under Miki Gorman’s year-old record and almost 10 minutes faster than her nearest pursuer yesterday, Katharine Switzer. Fraulein Winter simply set forth at noon and swung her mop at the other ladies at the very outset. With Will Rodgers, like Paul Revere, it was more a mat­ter of a delayed start. Bernie Allen, last year’s “morning glory” from England, did it again yes­terday — popping out like a champagne cork with a lot of quick fizz at the start. 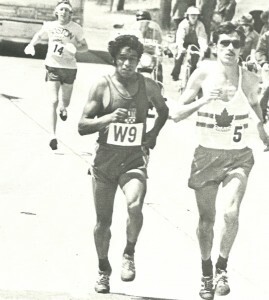 Early in the race, Bill Rodgers (wearing #14, his finish place the year before) chases leaders Mario Quezas (W9) and Jerome Drayton (5). This almost decked Rodger’s game plan because he hadn’t intended to let it all out so soon in the race. And when that enigmatic and dangerous Canadian, Jerome Drayton, quickly set out after Allen, Will had no choice but to join the early chase, too. “Drayton shook me up more than Allen,” Will con­fessed after he’d destroyed both. “Drayton is tough. I was surprised to see him going so fast so early. At first I didn’t recognize him. I thought of him as a small­er man. 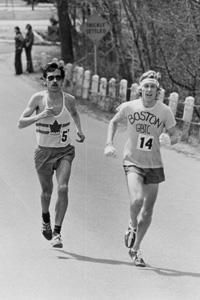 Allen, Drayton, Rodgers and the late entering Mexi­can, Mario Quezas, were in arm’s reach of one another into Framingham check­point, 6 miles, and running hard – :31.55 or 24 seconds behind Hill’s all-course record. And Hill — destined to fin­ish a fast fifth — was just to the rear with Richard Mabuza of Swaziland, who was beginning to feel des­perate as the chill breeze bit into his bones. So, Will Rodgers, a distant 14th man in last year’s Marathon, hung grimly onto Drayton, whose face was frozen into stern lines be­low his sun glasses. 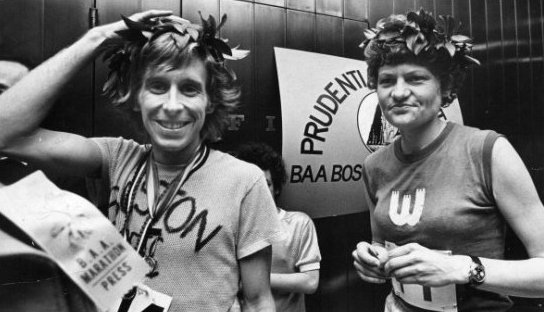 Down into Natick, two sec­onds behind Hill’s record now, the Drayton-Rodgers tandem fled, their strides in perfect harmony, an unusual orchestration in a marathon race. It wasn’t until the threshold to Wellesley Square, the halfway mark, 13.3 miles, that Will Rodgers, the Connecticut Yankee started priming his musket. When he pulled the trigger, the race, the record, and Jerome Drayton were doomed. It was at this point, Wellesley Square that Rodgers earned his first edge on Drayton — 30 yards — and on Hill’s all- course — 11 seconds. 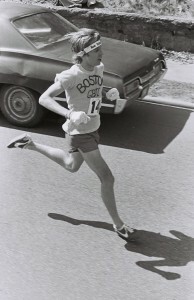 From thereon he simply kept getting farther ahead of everybody, and looking more and more like the Marathon’s Dave Wottle the process. Only one BAA winner ever ran the last half of the course with its ominous Newton Hills faster than Will Rodgers did, 1h 5m 37s — and that as Morio Shi­gematsu, the Japanese, 10 years ago to the day. Bill Rodgers drinks. Bill Rodgers ties. But Rodgers actually STOPPED running five times in that big, impor­tant interval — four times to accept proferred cups of water and once to secure an untied shoelace. The guy and the day were simply unreal. At one point, only 2 ¼ miles from the finish, he was one min­ute and 18 seconds ahead of the record and on his way to an almost incredi­ble 2:09:12 race. “Heck, the time I had as it was — well, I’m incredibly happy about it,” Rodgers said. 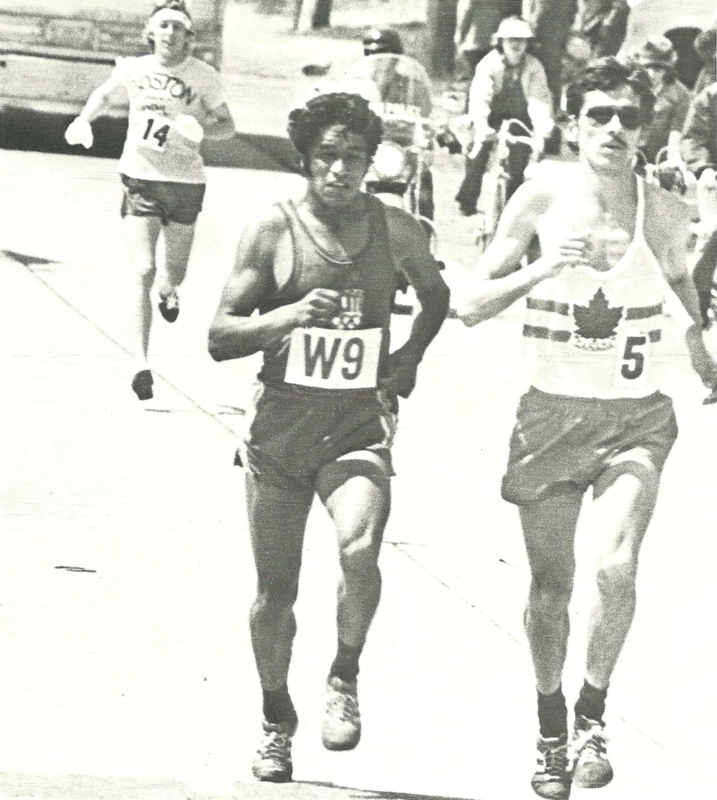 That he fell off from 78 seconds to 35 seconds below the epic Ron Hill record of 1970 probably, for him, was more a precautionary run over the final two miles than any­thing else. This, essentially, tells it all. Will Rodgers was willing to pay the price. The pollution index on the day was favorable, the meteorology (56 degrees, n’west quartering tailwind) of assistance, and the early competition sharp and in an extremely combative mood. 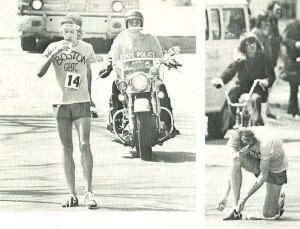 This was what it was all about within the structure of Will Rodgers’ sudden and dramatic Marathon shot that was heard ’round the world. At least seven runners in the field had speed indexes that read about equal going into the race at Hopkinton but, at the end, it was the old physical razzamattaz that really settled the issue.